As Axel and his crewmates stepped back aboard the Maverick, the sound of the captain arguing with someone over the comm network could be heard echoing down the ship’s main corridor. Curious to see what was going on, Axel passed through the living quarters to the communications array, his two crewmates close behind. There he found the captain staring down a gruff looking man in a cowboy hat on the display. “You owe me, Drake,” the man sneered, his voice raspy. “If that’s how you wanna play it, fine. I’ll be waiting for you.” With that, the captain hung up and the display went dark. The name sounded vaguely familiar to Axel, but he couldn’t quite put his finger on it. “Who?” the mercenary asked. Axel felt anger surging as he jumped to a conclusion. “So you were smuggling spice for him?” he asked. “So, can’t we just call the Federation up and explain what happened?” Ace asked. “Is there any way for us to clear this up?” Taraka asked. “Don’t tell me we have to steal the spice back,” Taraka said. “In the meantime, is there anything we can do to make up for lost time and money?” Taraka asked. “Sounds like a solid plan to me,” Axel said. “Yes, captain?” the Maverick’s pilot asked, poking her head out of the cockpit. It was quiet aboard the Maverick as the ship dropped out of warp space in the Luminae system. Most of the members of the crew were relaxing in their quarters, trying to get some shuteye while the ship was in transit. Seeing that the ship had arrived at its destination, Captain Cyrus Drake stepped out of his room and made his way to the cockpit. “Morning, Anya,” the captain said as he took a seat. “Sleep well?” the pilot asked. “As well as one can knowing there’s a bunch of pissed off smugglers after them,” Cyrus said with a laugh. Cyrus watched out the viewport as the planet Meridian drew nearer. The Maverick’s captain had been to the planet before and remembered it being quite beautiful. The planet’s northern and southern poles were covered in majestic mountainous regions which gave way to lush forests and, near the planet’s equator, what could only be described as a tropical paradise. Both of these regions made it a popular vacation destination for rich folks, for both summer and winter activities. Being the only civilized planet in this corner of Sector 32, it was also a major hub for Outer Rim traders and merchants. Most importantly, Meridian’s colonies were all funded by private Alliance corporations, meaning there was minimal direct involvement from the Federation. That made it the perfect place for the Maverick crew to try to pick up a new job in their current predicament. After breaking through the atmosphere, the Maverick flew over one of the planet’s beautiful deep blue oceans, then a vibrant tropical jungle, eventually arriving at the colony known as Fortuna. Cyrus reached for the comms as the ship set down on a landing pad in the colony’s spaceport. “Alright, boys,” the captain announced. “Time to get to work. We’ve got a job to find.” He then pushed himself up out of his seat and headed off to the cargo bay to meet up with his crew. “Think we’ll find something on this rock, boss?” Axel asked as they walked down the ramp. As they stepped out onto the platform, the crew was greeted with a beautiful vista. Fortuna’s spaceport was nestled along the edge of a massive cliffside, and the landing pads were suspended above the jungle valley below, overlooking a winding river that flowed out toward the ocean. It was quite a sight to behold. “What a pleasant view,” Ace commented. Cyrus led his crew off the landing pad toward the spaceport main hub, stopping briefly to pay the docking fee. There were several other people milling about, presumably crewmembers of the various ships that were also docked in Fortuna’s spaceport. The Maverick crew moved through the crowd, into the port’s indoor atrium where various merchants and traders had set up stalls to sell their wares. “Where do we find a job in a place like this?” Taraka asked, looking around the atrium. “Where might we find this job board?” Ace asked. “Should be somewhere around here somewhere … Aha! There.” The captain spotted the job board against the far wall and began walking in that direction, his crew following behind. Cyrus approached the board, then began scrolling through its holographic display. “Let’s see what we’ve got here … exotic foods … supply run … transport …” Looking through the list of jobs, the Maverick’s captain wasn’t finding much in the way of work that didn’t require traveling to worlds with strong Federation presence or dealing with people directly for long stretches of time. Those jobs wouldn’t do them much good if they wanted to keep a low profile. Suddenly, one job caught Cyrus’s eye. “Now that’s interesting,” he muttered. “What is it?” Axel asked. “What’s the job?” Axel asked. “Or my past,” Ace spoke up. Notes: Short chapter this time. In fact, it was short enough that I wrote the whole thing over the course of one day, not including the time spent listening through the session recording to make the outline which I did a few days beforehand. For pacing reasons it made sense to make this its own chapter since it doesn’t make sense to combine either of the two scenes with the previous chapter or the next chapter. After wrapping up the combat encounter from the previous session, I fed the players a little bit of a plot hook explaining what the cargo mix-up was all about, introducing our first antagonist, Anton Rooker. The party decided they wanted to pick up another job to get some money in order to prepare for taking Rooker on, so they hit up a civilized planet. This session, I had my planet generator macro in Roll20 ready to go, so I tried it out, giving us Meridian, a planet with tropical biomes and snowy mountain biomes. One of my favorite things about using a planet generator is taking the info it spits out and using it to create an interesting planet description. Writing up the descriptions of Meridian for this chapter was a lot of fun. This part of the session was all kind of made up as I went along since I wanted to work on improv GMing with this campaign. Since I was still kind of getting a feel for it, it was a little rough for the session, but the players were supportive about it, and I got to touch it all up in going back to write the chapter. It’s just one of those things you get better at as you go along, and I definitely improved over the course of the campaign. Post-Chapter Challenge: Since we introduced the planet generator in this chapter, how about I tell you how it works and then base a challenge around it? The one I use for this campaign randomly selects two biomes from a list of biomes, as well as a Pokemon type that is common on the planet, which I then use to describe the planet. For instance, if the generator spit out Arctic and Mountain for biomes and Fire for type, I’d say the planet is a cold, snowy planet with volcanic mountain ranges. It might also lead to interesting type-shifted Pokemon, perhaps an Ice/Fire Mamoswine or something like that. My challenge for you is to pick two biomes and a Pokemon type and use them to describe a cool planet. Since the campaign is still ongoing, your planet might make an appearance if I like what I see. Spacemon: Frontier - Chapter 3: Scorching Scuffle on Scoria! 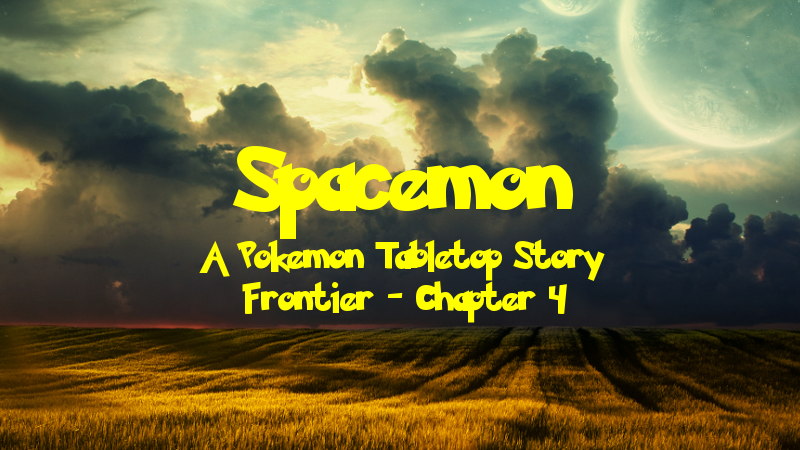 Spacemon: Frontier - Chapter 5: Specters in the Swamp!